The petit h atelier is no ordinary workshop. It's an open playground for the exceptional métiers of Hermès, established by artistic director, Pascal Mussard. Here, unique objects are re-invented by expert craftspeople. Petit h is about transformation and fantasy. This holiday season, I was given the opportunity to share my take on these themes in Hermès boutiques around Manhattan. I created scenes for an interactive exhibit which reflected the playfulness and unique elegance of petit h.
When word came back from Paris that Pascal loved the animation, the path opened. I expanded on the spirit of these scenes in many forms throughout the activation. Whimsy and fantasy were brought to life in illustrated interactive windows and I created designs for animated neon signs. Tall tales tower over one entering the Madison Avenue store. Visitors of the Madison Avenue store view the animation interactively, turning a Captain's wheel to change from one vignette to the next, or pulling a lever to see more unique animation. This night was magical, a culmination of weeks of unique creative work. Guests conversed by candlelight. Whimsical music and animation accompanied them. "Coming Soon" windows for Madison Ave. 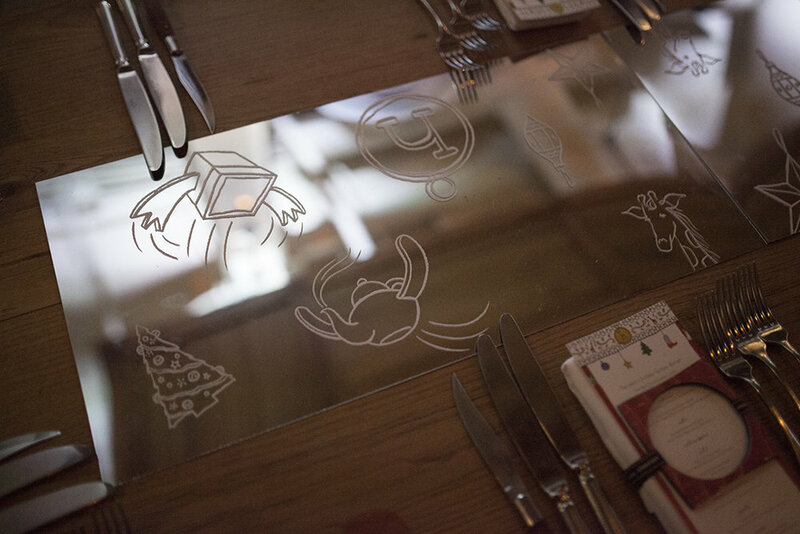 Selected sketches from advent calendar windows. Our starting point for the animation came from the sketches of Alexandre Mussard, son of Pascal. This project was an amazing journey from concept to completion. Thanks to CD, Michael Goldberg, and the teams at DML & Hermès for the opportunity to create this world and its many iterations.